Finding a trustworthy online casino to play at is one thing, Finding high roller live casinos for VIP players that like to wager big stakes is another! 80% of a casinos income comes from 20% of their player base. The one overriding thing you want to know when you’re playing, is that if you win will you get paid? So it makes sense to play somewhere where you know this will happen. You’d be really surprised how many people don’t do their homework. They are seduced by a flashy website and the offer of big bonuses, sign up, start to play, and then get in trouble when they want to withdraw a big win. Withdrawals limits in place. Some casinos place a cap on how much you can withdraw and over what timeframe. It’s almost laughable as they don’t set these limits on deposits. They are quite happy to accept a £10,000 deposit and then limit you to £1000 withdrawal a week! Some have maximum win limits. Wins are capped to certain amounts. I tend to see this more with Casinos that have sports books than anywhere else. Withdrawal times are unusually long. In this day with sophisticated electronic funds transfers this should be hours not days. It’s understandable for big wins to be verified but this should take no longer than a few days before funds are released. 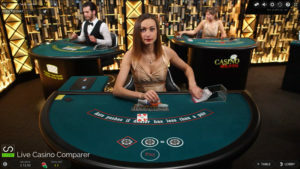 How to find a good casino for VIP players? Use Review websites to do the initial hard work for you. Pick the online casinos that meet your playing requirements and then look at their Terms and Conditions closely. Look at where the casino is licensed. The best casinos tend to be licensed in Alderney, Isle of Man, Malta, United Kingdom or Kahnawake . Do a search for complaints about a casino. If there are any, you’ll find them. Contact the casino and speak to the VIP host. If they don’t have one, find somewhere else. Don’t be fobbed off by the customer support reps. Negotiate the terms you’ll play there for. As a high roller you can negotiate more favourable terms when playing. Like cash back on losses, no deposit bonuses, better withdrawal terms etc. Of course just because you say you are a big stakes player doesn’t mean you are. Initially the casino will be wary and will want to see some deposits before they deliver what’s agreed. Expect big wins to be verified by the casino and the software supplier. It’s normal for this to happen and can take a few days. Some casinos have clauses about using betting systems in their T&C’s. Be sure you understand the clauses as they can and will be used to not pay you if they find you’re breaking a contract clause. If you’re a regular player playing normally you’ll have no trouble. Live Casino games tend to have generous betting limits, but these can be increased on a player by player basis. Don’t let the initial table stakes put you off, the VIP host can get these adjusted for you. Special Salon Privee tables are now available where you can play in private on a table by yourself. Blackjack, Roulette and Baccarat are the main games available in this mode. Still not sure and want some help? I’m more than happy to help negotiate better terms with a casino for you. Or if you just want to bounce ideas, validate your choice or want a second opinion. Just email me, neil at livecasinocomparer.com. Up to the early part of 2018 all we’ve really seen is a selection of tables branded VIP, where the stakes are elevated slightly to keep the low stakes players out. The actual VIP experience at these tables only extends to having a more experienced dealer looking after you. Quite honestly this is a waste of a great dealer, as most of the time they are just sitting there waiting for players to arrive. I wouldn’t want to presume that I know, as everyone is different. But I’ve been playing for a long time and have rubbed shoulders with many different types of players. Essentially everyone is looking for the same. A fair game and a good level of service while playing. All players would like to increase their chances of winning, but unfortunately the doors for allowing that to happen are only opened for the truly wealthy player. Play with a specific set of rules for the game. Have the opportunity to request a re-shuffle when playing card games. Request a change of dealer because they’re not lucky. or anything that increase the chances for the player to win, or seemingly so. Can you get this online? The answer is YES and it’s getting easier all the time as casinos recognise the personal service some players desire. The software providers are now providing games that can “configured” for certain players. The reputation of the casino. The games that can be played. The right level of stakes. No restrictions on depositing or withdrawing. So, it’s with this in mind that I have researched and written this article. What you should look out for? Two products are set to change High stakes playing at online live casinos. Salon Prive – is a dedicated set of Blackjack and Roulette tables specifically set aside for the high roller. These are provided to casinos by Evolution Gaming. You need at balance of at least £6,000 to get a seat at the table and minimum stakes start at £1,000. A table to yourself. Play on your own and take as many seats as you like. For Blackjack, you can request a dealer change or have the shoe re-shuffled. There is a dedicated VIP host on hand to deal with any queries immediately. For Roulette you can choose you’re spin times to be as quick or slow as you like. 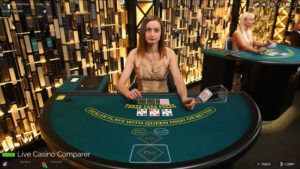 Sioree Blackjack is the latest VIP Table from Playtech. Minimum stakes is £50 a hand the max is £10,000. It’s a multi player table. You can request the dealer stays on or is changed every 30 minutes. You can request a shuffle of the shoe. A dedicated host is available to resolve any queries. First of all house edge is a very important component to throw into the mix and therefore the house rules for Blackjack need to be considered. Check out my analysis of blackjack features across the software providers to appreciate the differences and help you understand the reasons behind my choice. 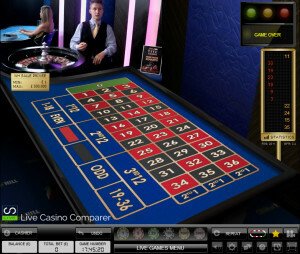 While BetVictor only has one dedicated table, they do have the highest maximum stake of any live casino at their BV Grand (Evolution) Live Casino. The table you need is Fortune VIP or one of the Salon Prive tables (min – £1,000, Max – £10,000). Stakes on the Fortune table start at £250 up to a max of £10,000 a hand. You can play Perfect Pairs £5 – £500 and 21+3 (Rummy) £5 – 250, side bets as well. You could try the Playtech Soiree Blackjack table at Betfair, with stakes up to £10,000 a hand if you prefer something not Evolution. Although some live casinos offer American roulette I’ve chosen to concentrate on the European (single zero) version. This is because of the better Return To Player %ages and the stakes are really low at the casinos offering American Roulette . William Hill have the highest table stakes on their dedicated table WH Salle Privee, with a table limit of £25,000. The max straight up bet is £1,000 GBP and odds/ evens at £5,000 GBP a spin. You can also play with La Partage at the French Gold Table, but the max straight up bet is only £100. However BetVictor has a Roulette VIP table with a lower table limit of £50,000, but with higher straight up bets of £1,500 GBP and an odds / evens limit of £10,000 GBP. Another alternative is Unibet, who have the broadest selection of foreign language tables. You’ll find English, Dutch, German, Turkish and Swedish tables. The VIP table has max straight up bets of £250 GBP and odds/ evens of £4,500 GBP. All three casinos have access to the Salon Prive Roulette tables if you prefer to play on your own with no-one watching. 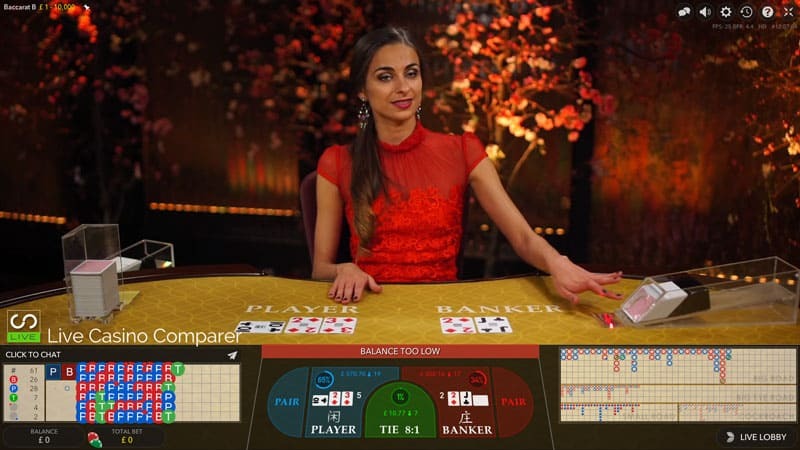 In its basic form Baccarat is played between Banker and Player, with you betting on who you think the winner will be. Additional side bets are available on some games. The most common is Pairs followed by Big/Small, Dragon/Tiger & Sum Bonus. There are also some establishments offering progressive jackpots. For further info see my Baccarat Side Bets page. 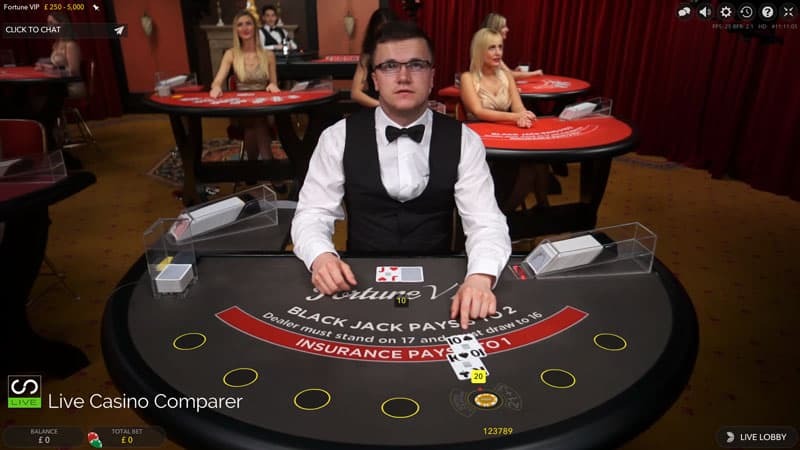 BetVictor win out with the highest stakes on their Baccarat VIP table where you can bet a max of £35,000 GBP a hand. William Hill also have come a close second with a £25,000 max bet on their dedicated Macau and Mayfair Baccarat tables. Both of these have the Pairs side bets. If you’re interested in playing the Big / Small side bet you’ll find it at Paddy Power with a max table bet of £7,500. This is a Playtech live casino. Casinos running Playtech, Evolution and Microgaming software have Casino Hold’em. You can forget about any of the Microgaming ones as the stakes are really low and the Playtech ones just don’t get near the stakes of the Evolution casinos. There are 3 that I can recommend. ComeOn is new to this list but is a well established casino with a really good reputation, great customer support and fast cash outs. Their Casino Hold’em has a max bet size of £6,000. While William Hill has their own dedicated table, it’s the general play table where you can play for higher stakes. Max bet limit is £7,500 GBP. Unibet are another Evolution live casino and their bet limits are £4,500 a hand. A Progressive Jackpot can be played at these casino for an extra £1 a hand. The current Jackpot amount is £2,469,927. 3 Card poker is only available at Evolution based casinos. The max table bet at all of the casinos is £10,000. There are two side bets that can be played alongside the main hand and these all count towards the table limit, so you need to be watchful when you place the initial Ante and Side Bets. BetVictor has always been good for me, so that’s where I’d play. ComeOn and William Hill are as good. Watch out at William Hill, the dedicated table has lower stakes so play at the general play table. Caribbean Stud Poker is played against the dealer. Both Evolution Gaming and Xpro Gaming have versions of the game. In the Evolution version one player hand is dealt and in the Xpro version 5 hands are dealt. As I can only play the Evolution version I can only personally recommend casinos that have that version of the game. Most of the casinos have the same stake limits for this game. I’d recommend 32Red, as they are well known to look after their players really well. VIP’s included. The only real downside is the fairly recent slowing down of payments. You get you money but it takes a few days now, rather than a couple of hours. The current Jackpot amount is £534,643. Ultimate Texas Holdem is the latest of games from the Evolution stable. Not all casinos have taken the game, which is rather a surprise as I think this is the best of the poker derived table games. Stakes, when compared to other games are relatively low. The table max is £1,000 which is more than enough for me, but a bit low for those that like to wager larger amounts. Unibet and William Hill get the nod here. If you’ve got this far you’ve probably gathered that there are only a handful of live casinos that have high limit games. While a lot of casinos have “VIP Tables” they are aimed more at the mid roller than the high stakes player. It’s possible to play multi hand Blackjack at all of the casinos I’ve recommended, which is another way to increase your stakes on the table. But there’s more to it than just being able to place big bets. The casinos all have a good player reputation, have good customer support and pay out in reasonable time frames.